The Mac Photos app uses various motion animations in the interface that are similar to those which appear in the iOS world, with plenty of zooming, panning, and other eye candy for doing simple tasks like opening a picture. Those eye candy effects may look nice to some users (and nauseating to others who are prone to motion sickness), but the other side effect of having user interface animations are a slightly slower app experience, since many actions within Photos for Mac OS X have to draw a snazzy animation between events, like opening a picture to full size. 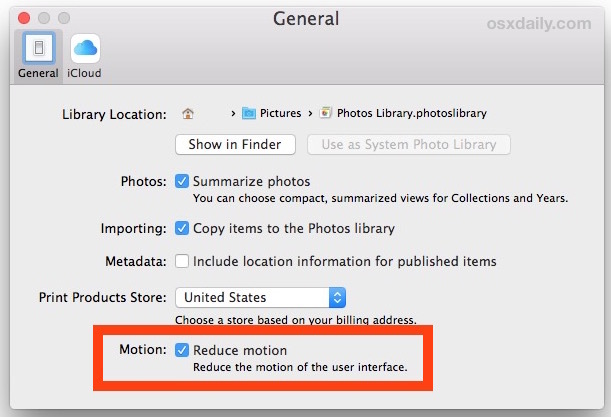 Thus, turning motion animations off can effectively make the Photos app noticeably speedier. Note the performance boosting effect may be barely noticeable on the latest and greatest Macs with tons of RAM, an SSD, and plenty of processing power, but on some Mac models this can really make a nice difference and improve the Photos experience. This is particularly true with some Macs if usage of Photos app experiences stuttering animations and choppy frame rates when viewing images, zooming around, editing, and moving around the photo library, since Reduce Motion will stop the animations in favor of the simple transition, lightening the load on the hardware a bit so that it can focus on drawing your image library rather than presenting them in a showy manner. This is easy to enable and disable, so there’s little effort in trying this out to see if it improves the performance or experience of Photos app for you and your Mac. If you don’t notice any difference or don’t care, you can always turn it back on again. Gone will be the zooming around animations, instead you’ll get fast fade in-and-out transitions between events in the Photos app. While this offers a nice performance improvement for Photos app in Mac OS X, it’s also invaluable for users who can get vertigo or motion sickness from the ubiquitous use of zipping, zooming, and moving around animations that Apple implements widely. It’s not a pleasant experience to feel nauseous from using any software, let alone adjusting your photo collection, so if you’ve ever felt a bit queasy when using Photos app try this out, even if you don’t notice the mild speed boost you may appreciate the lack of gaudy animations. Let’s hope system-wide option like this arrives in Mac OS X at some point, given that Reduce Motion is available in iOS for iPhone and iPad users and similar limited motion animations on the Apple Watch too, it would be a natural fit to come to future Mac system software as well. For both iOS and WatchOS the feature can speed up performance on those devices as well, so presumably you’d gain a similar benefit in Mac OS X, and it’s always nice to have choices, right? Thanks. Immediately turned this off. I don’t want any annoying animations, they’re so poorly implemented that even on my new shiny MacBook Pro the frame rate drops when enlarging a picture from thumbnail to full screen, it looks like it’s about 5 FPS. Come on Apple, who writes this stuff? Does anyone test this stuff in real world conditions? This is not a joke, but Windows 10 running in Parallels has smoother animations than OS X does. And it’s in a freakin’ VM! Running atop OS X El Molasses! I’ve been asking those questions since Mavericks. I can’t imagine how frustrating these things would be for people who experience nausea when using the software. Does the Apple Store sell dramamine? I tried this but my Photos does not show that option, likely because it is 1.0.1 so I went to find updates only to discover the App Store does not seem to recognise Photos … so how do I check the current version and update? I think the migration from iPhoto to Photos has not been smooth. Photos is updated with OS X. I’m not entirely sure, (I’m running Mavericks) but you likely have to install 10.11 to find this option. Thank you for this great little tip! i have this check-marked on – but, i see practically zero change. still all the goofy animations are everywhere. i especially hate the edit mode menu animations… what a waste of time, and the animations add no greater feature or information understanding. seriously, how to stop them? Am running Photos 4.0 and do not see this option. I only see Photos, Memories, Importing and Metadata.